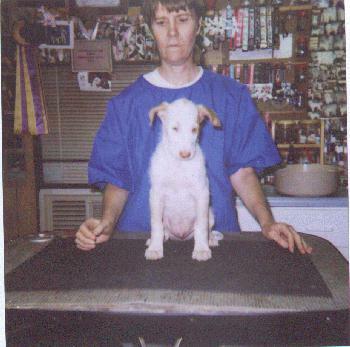 This is "Astro" at 7 weeks of age with Grandma Susan (his breeder). 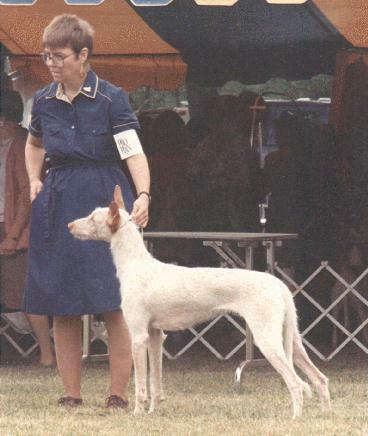 He was a wire haired Ibizan Hound. Astro was born on April 22, 1999. And with a very heavy heart, I have to write that Astro died on October 9, 2002. I had to put him down. He seriously attacked Chaos. I had 2 dogs cross over Rainbow Bridge because of this fight. He had 1 brother & 5 sisters. This is Astro's dad, "Cecil" (AM/MEX. CH. Mukavamekastaja~, JC) who was born in Finland. His owner is Leslie Lucas. This wss Astro's mom, "Hillary" (Ch. Strangedays X-Quisite) resided at Strangedays with Susan and Peter Viveiros in Tiverton, Rhode Island. Hillary died in 2004. This is Astro at 8 1/2 weeks of age. This was taken the next morning after he arrived here. Astro & Kito are playing on the waterbed. Astro 8 1/2 weeks, Kito 7 1/2 months. Kito is wearing a bandage on his foot because he sliced his pad running in our field. Astro (8 1/2 weeks) might look scared as Kito is looking at him, but actually right after this was taken, Astro jumped on Kito & pulled him around the room by his lip! Astro is laying in the sun, on the rug, at 9 weeks. Those ears sorta look like wings & he's ready to fly. Kito (Ridgeback 8 months livernose) and Astro (11 weeks old) just sitting back & listening to the radio! Astro's full name is "CH. Strangedays DeJaVu RuffNRedy, JC". Astro earned his championship on May 5, 2001. 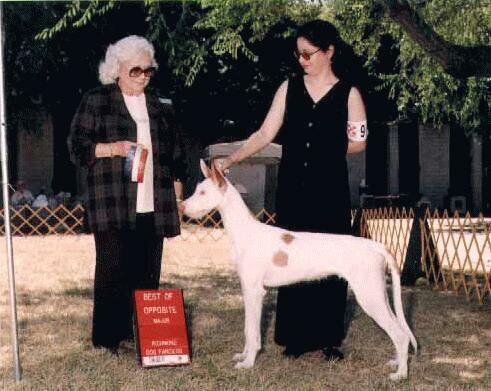 Astro earned his Junior Courser title on June 23, 2001. Jan Winner & Taylor- Not yet, but can see pictures of Taylor on Grandma Susan's web site. Nancy and Michael Haley & Mariah- Not yet, but can see pictures of Mariah on Grandma Susan's web site.